The Mercedes-Benz SLC 300 Roadster remains popular with individuals desiring a sportier vehicle that also offers luxury and class. 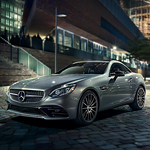 The new Mercedes-Benz Roadster was designed to provide a more thrilling performance. Indulge in a luxurious experience by taking one of our Mercedes-Benz of Tacoma vehicles for a test drive. The SLC 300 comes equipped with a 2.0-liter turbocharged engine that delivers up to 241 horsepower and a nine-speed automatic transmission. The Roadster is capable of going from zero to 60 in 5.8 seconds. The vehicle has a city fuel rating of 23 mpg and a highway rating of 32 mpg. The Eco start/stop system turns the engine off when idling and resumes once the driver takes their foot off the brake pedal. The technology enhances fuel economy and reduces harmful emissions. The sporty car also features a sporty exhaust system, staggered-width tires and wheels along with a torque vectoring brake system.